Cleavers and goosegrass are two of the other names for this extremely common species. It is perhaps most often noticed scrambling over plants in hedges, but grows in a variety of other places, including coastal shingle banks and rubbish dumps. It is a slender but vigorous climbing annual, covered by tiny hooked bristles. The flowers are tiny and four-petalled and they are succeeded by small, hard, green globular fruits which are also covered by hooked bristles. 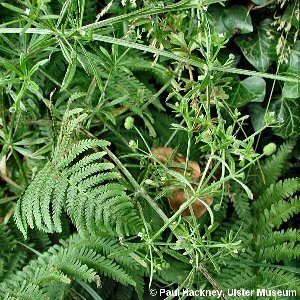 The plant is notorious for its ability to cling (or cleave - whence 'cleavers') to clothing or animal fur. 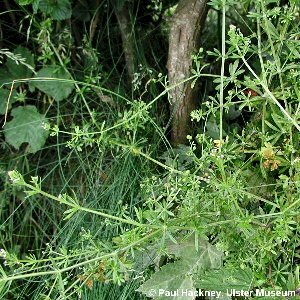 This plant is one of a group called the bedstraws (Galium spp. ), all of which have slender stems and leaves arranged in whorls at the nodes. All have white flowers except lady's bedstraw (G. verum). All names: Galium aparine L.